Thursday's local elections for Manchester City Council didn't produce many surprises. But Labour did have to cede one council seat to the Liberal Democrats. Former MP, John Leech, won Didsbury West with a 702 majority. See the maps below for the full picture. After last year's elections, Manchester was solidly red - leading some to call it a "one party state." But after this year's election, there's a spot of orange in Didsbury West. Click on a ward to show full results. But if we look at the second placed party in each ward, a more nuanced picture emerges with the Green Party managing second place in 9 wards. 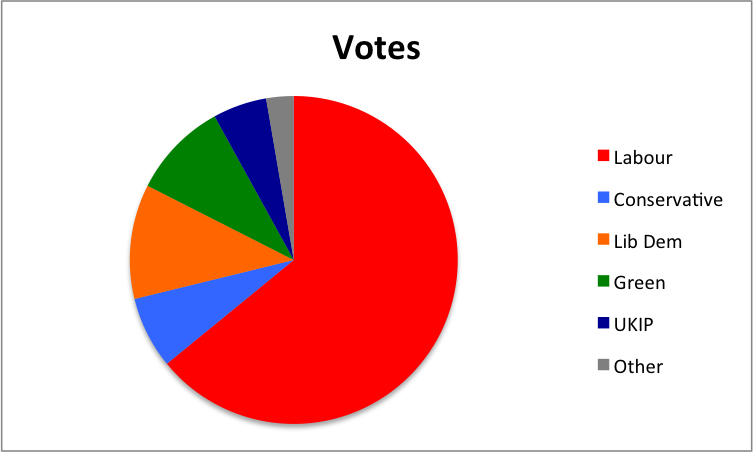 Here's how the 105 487 votes cast across all 32 wards in Manchester were shared between the parties. But turnout was typically very low for a local election and significantly lower than the 2015 vote which coincided with the General Election. In 8 wards, less than a quarter of registered voters actually cast a vote. It will be interseting to see whether the European Referendum on June 23rd will motivate more Mancunians to head to the polling station.